SKU: Ego11Gun Categories: Planet Eclipse, Specials Brands: Planet Eclipse. 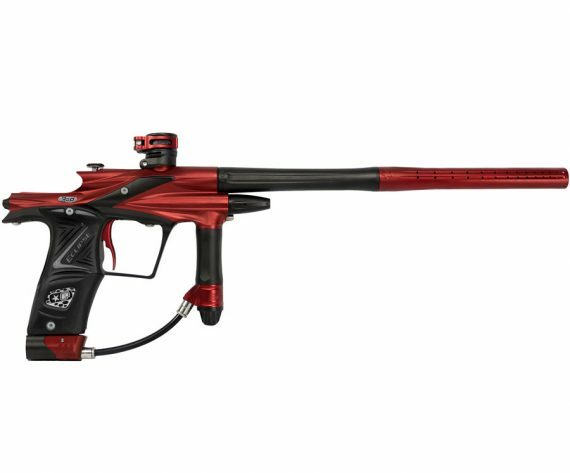 Following the trends in paintball and being able to react and respond to them in a way that benefits the player in a positive way is a difficult thing to achieve. Being able to provide a product that is all things to all men is even harder. Planet Eclipse have always prided itself on being able to react quickly, give the customer what they want, when they want it, and to give users the flexibility to have their marker just how they like it. This philosophy has never been more evident than it is in the New Ego. Over the past 18 months you will have seen Planet Eclipse taking steps to help improve the “feel” of the marker during play, as well as to improve the ability of the markers to handle super brittle tournament paint. Controlling the speed of the bolt in any marker is the key to achieving improved feel, reduced sound signature, and more gentle handling of the paintball within the marker. The more gentle the acceleration and deceleration of the system, the smoother the marker feels. But of course doing so does have its drawbacks. For example by slowing the cyclic speed of the marker, you also reduce the rate of fire. As with many things in life there is a trade off. As we look to improve the feel of the marker on one hand, we inhibit it in terms of outright speed on the other. But what if you want your Ego to shoot fast like Egos used to shoot? If the marker is tuned for smoothness, how do you get the speed? What if you want to shoot 15bps but want it smooth? What if you only care about shooting 12bps because that’s all you can use with PSP rules but want it to be as smooth as possible? How can you cave all these things in one solitary marker? Well until now, it just wasn’t possible without making major, time-consuming physical changes to the pneumatic system of the marker, or even re-machining parts to allow different dynamic characteristics of a marker. But not now. Not any more. The Ego comes equipped with an industry first. A bespoke solenoid manufactured by MAC Valves USA that incorporates twin flow control devices. Etched into the side of the solenoid body is easy to make out the two incremented scales. Below the scales are two one-quarter turn Solenoid Flow Controls. These Solenoid Flow Controls, fitted with pointer and limit stops, can now be used to independently control both the forward and rearward speed of the Rammer. For the first time ever in a poppet marker the user can now tune the speed, feel and rate of fire of their own marker with a simple twist of an adjuster. In the time it takes you to turn off your tourney lock, the Ego11 can be switched from a high speed, max ROF, uncapped, free-for-all machine, into the softest, gentlest, smoothest shooting capped PSP poppet you have ever felt. Or how absolutely anything in between?! The analogue adjustment means infinite control of the speed of the bolt and rammer in either direction giving unprecedented influence over the dynamic characteristics of each marker. 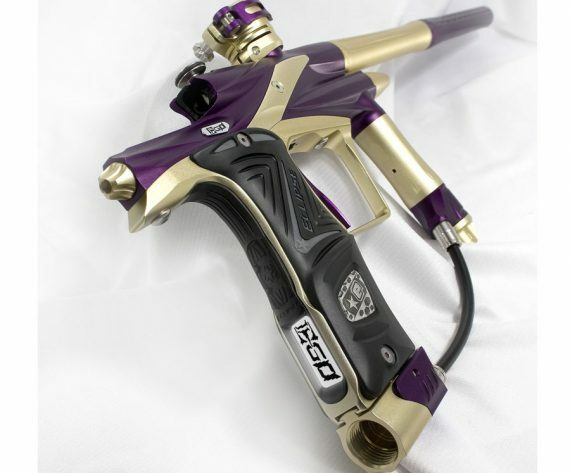 It looks like you really can have your cake and eat it with the Ego11. But the solenoid is not the only place that has a complete overhaul. Take a look around the grip frame and there are several things that should jump out. Like the new POPS ASA. POPS stands for Push On Purge System and is a completely new concept in On/Off/Purging ASAs. The idea is simple. Just push back on the front “Bonnet” section of the POPS and this depresses the pin in your tank, gasses up the marker, and then latched itself into place. Gassing up the marker takes a fraction of a second. Once gassed up the bonnet stays in position until the pushbutton on the side of the POPS bonnet is depressed, at which point the bonnet pops forward and the marker purges its air. Again, de-gassing takes a fraction of a second and very little effort. The new POPS also features, of course, T-Slot mounting to the frame, but this time with longer adjustment range than the previous Eclipse ASAs. It also hosts front porting for the first time on an Eclipse ASA, as well as new fittings that require Loctite or tape to seal in and can be removed quickly and easily with a hex key. 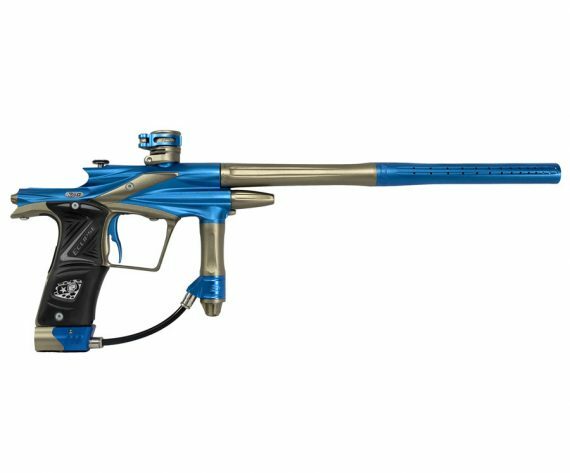 The new fitting takes air via the shortened macroline hose into a new angled swivel on the exceptional SL3 regulator which also comes with one of the new fittings. The SL3 regulator should need little introduction at this point. It was first seen on the SLS from last season and then went on to appear on the Geo2. The SL3 reg retains all of the simplicity of the old Eclipse regulators, but also throws in a load of new features and even better performance. Notably the regulator has a new seal system that means the regulator seal can now be flipped or replaced if required, and is more durable to start with. No piston replacement needed with this new design. The regulator also performs far superiorly across a very wide range of input pressures. You can run HP or LP tank, flipping between the 2 without any effect on marker velocity. 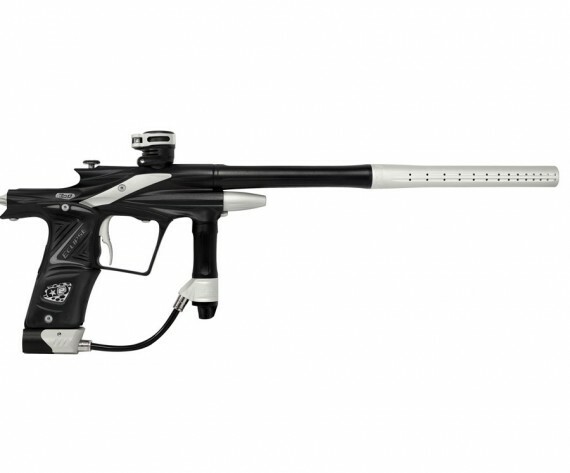 The benefit of this added stability is even more evident when it comes down to the game, where you can shoot the Ego11 at full velocity right down to the last 200-300psi in the tank. You can really squeeze every last bit of performance out of your system. Those who are observant may also notice a new spacing between the SL3 reg and the grip frame. The inclusion of the new solenoid has given the Ego11 the opportunity to spread its stance a little. The frame has been moved backwards allowing more room between the front regulator and the trigger guard. Just enough to add some additional support and control to the marker, but not enough to forsake the compact dimensions and sharp handling that Ego users have become so accustomed to. 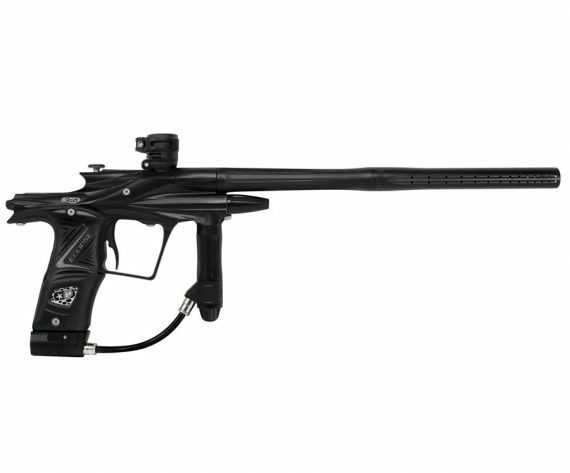 The Ego11 has some other quite interesting changes to the ergonomics of the frame. The new frame profile along with, yet again, a higher grip position combine with an all-new grip that is actually sunk into the frame around most of its perimeter. These in turn with a brand new co-molded console that runs all the way up the back of the frame to add comfort and grip. Slimmer in the middle section of the grips, and with grippy rubber running down the back of the frame, the look and feel of the Ego11 is still fresh. Simple mechanical changes ensure that the grip screws clamp down firmly into place without the chance of crushing the grips or, more importantly, some delicate internal component. Of course inside the frame there still lies the ubiquitous Eclipse circuit board, fitted with extra large tru-color backlit LCD module, sounding device, triple external pushbuttons, micro and opto sensing triggers, 16-bit processor and expansion port that allows connection to PC with the optional E-Portal2 kit. With all the adjustability and functionality you could ever need, the range of adjustment on the Ego11 is simply breathtaking. Refill counters, ROF indicators, timers, audible beeper, debounce presets, RF enabled, you name it, the Ego11 board will do it or support it. And when combined with the new direct acting solenoid, the prioritized drive circuitry will ensure that shot-to-shot consistency and rate of fire accuracy are the very best they can be. Also inside the frame, and in charge of actuating the micro and opto switches on the board, is a new trigger, with new bearing carrier, and new spring system. The trigger has 5 points of adjustment. Forward travel, rearward travel, magnetic return strength, spring return strength and finally micro-switch actuation point. Designed in the ever-popular S-style, the trigger has the smooth, slop-free action that has been the backbone of Eclipse markers for years. It’s wide range of adjustability and option of magnetic or spring return make it quick and easy to set up to any individuals liking without the need break the gun apart to get at adjusters. As with everything in an Eclipse marker, simplicity is key. Internally the Ego11 boasts the Zick2 kit, the Cure3 bolt, the same adjustable LPR found on SLs as well as the LP protection vent that was found in the Ego10. All highly proven, tournament winning components. And up front, you’ll find the new Shaft4 barrel in 14”, 0.689” bore configuration that has been receiving outstanding reviews since its launch on the Geo2 earlier this year. Re-designed for better efficiency and consistency, and ported for reduced sound signature, there really is no need to replace exceptional, stiff arbour honed, premium barrel. Finally, the Ego11 comes packaged in a new zippered case, which includes in its contents a full hex key set, oil, barrel sock, full-color 84-page manual, and a comprehensive spares kit that includes regulator components, o-rings, detents, springs and screws. The Ego11 has been developed and created with the soul intention of giving the modern player the things they most desire in a modern paintball marker. A smoother shot. A quieter sound signature. Outstanding Efficiency. Unparalleled reliability. Simplicity. Industry-Leading Customer Service. Ergonomics. And built-in User Adjustability and choice. All from a company that whatever the situation, whatever the occasion, will always have your back. The Ego11. Born of the Player.